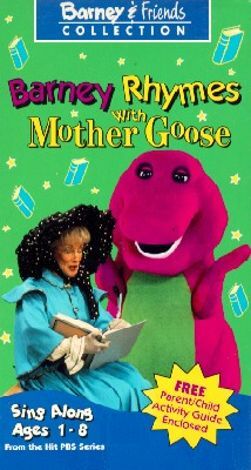 Children between the ages of one and eight may enjoy watching this Barney episode that features many of Mother Goose's favorite rhymes. Barney and the kids come to her rescue when she discovers that she has lost her precious book of rhymes. The kids start singing them from memory to help her Mother Goose recall them. Among other tunes, kids can learn how to sing "Hey Diddle Diddle," "Three Little Kittens," "Peter Peter Pumpkin Eater," and "Little Miss Muffett."